Forget the bar crawl! The best mixed drinks, cocktails and libations can be enjoyed from the comfort of your home — provided you have a few stocked staples and taste buds willing to get creative. Making mixed drinks and cocktails at home is simple and fun, even without a restaurant-worthy bar cart. Master your inner mixologist with the following easy cocktail recipes you can whip up in your kitchen — some classics, and some twists on old favorites, but each leaving your friends wondering if you secretly have a bartender’s license. What Should I Have at Home to Mix Cocktail Drinks? Knowing how to make different mixed drinks has more to do with keeping a few core items on-hand and less to do with owning every single spirit, mixer and garnish out there. As the saying goes — keep it simple. You’ll find a less-is-more mentality allows cocktail ingredients to shine through on their own, without conflicting or overpowering flavors. These basic bar cart items give your pantry a solid drink-mixing foundation. You’ll have just enough finesse to begin making high-quality, tasty cocktails from the convenience of home. Lemons and limes are to cocktails what salt is to food. Sure, you can have a meal without salt — but it’ll be a meal severely lacking flavor since salt enhances the characteristics of any ingredient it touches. Keep a handful of fresh lemons and limes in your refrigerator to begin building up your drink pantry. They’re cheap, available at any grocery store and keep for weeks. And while a lemon or lime wedge works as a fantastic drink garnish, they serve a more important purpose — the juice from whole lemons and limes provides the base for a substantial amount of easy-to-mix cocktails, ones you likely already enjoy. For an even simpler option, opt for bottled citrus juices or syrups. A few drops will lend those essential sour-sweet notes to drinks. Club, seltzer and tonic water are actually three different kinds of liquids. Though subtle, those differences affect the composition of a cocktail, changing how strong its spirits taste plus how well all liquids mix in a glass. Seltzer, or sparkling water, is artificially carbonated plain water. It contains no other additives or minerals. You can readily find naturally flavored seltzers in any grocery or convenience store, boosting your mixed drink creativity. Club soda is also an artificial and carbonated water-based beverage. Unlike seltzer, though, club soda contains added minerals and compounds such as potassium sulfate and sodium chloride (table salt). These additions give club soda a little extra tang compared to plain seltzer. Tonic water is like club soda taken one step further — in addition to the carbonation and minerals, tonic water includes sugar as well as quinine, a natural compound sourced from tree bark that lends tonic water its signature, bitter taste. Jigger: These stainless steel, hourglass-shaped utensils let you easily measure spirits and mixers by the ounce for perfect drink ratios. The smaller side measures 1 oz. of liquids, while the larger size pours 1.5 oz. Shaker and bar spoon: Shakers are preferred to mix liquor or spirit-forward drinks, like gimlets, Manhattans and cosmopolitans, whereas a bar spoon works better to mix more sugary or citrus drinks, like mojitos and Palomas. Strainer: Many classic cocktails are made even better with the addition of fresh fruits and herbs. Pour any crushed or muddled produce through a strainer before adding to your drinks, though, to ensure unwanted seeds and chunks stay out of sips. 3-4 oz. cocktail glasses: Standard size cocktail glasses are between three to four ounces, though large ones can exceed ten. Since most drink recipes give directions in ounces, it’s ideal to have a few standardized glasses at home to make pours easier to measure or eyeball. Simple syrup is a sweetener used in a range of cocktails. You can purchase a bottle or two at a nearby liquor store or whip up your own. Simply pour equal parts water and sugar into a medium-sized saucepan, then slowly bring to boil. The sugar will dissolve, leaving a sweetened, slightly thicker liquid behind to add to your mixed drinks. Want some real mixologist magic? Impress your friends by adding lemon or mint to your simple syrup. Just squeeze the juice from a lemon or add a few mint leaves into your saucepan base, bring to boil and let its flavors steep. We all forget to refill the ice cube tray every now and then. Yet most good mixed drinks require a cube or two to keep contents smooth, balanced and refreshing — and a whole lot more if you’re making blended cocktails. A few ounces of the following spirits make a mean base for the vast majority of popular cocktails. Having a bottle or two of any of the following liquors opens the door to making better mixed drinks at home. Triple Sec: Triple Sec is a popular orange liquor with a strong, sugary, pungent aftertaste. Aperol: Aperol is a bottled, orange-rhubarb Italian liqueur that can be sipped on its own, made into spritzers by adding seltzer or splashed into light summer drinks. Campari: Campari is similar to Aperol — it’s even made by the same company — yet contains less fruit and heavier notes of bitters and aromatics. It is the classic base when mixing negronis. White rum makes for easier cocktail mixing than its spiced, golden-brown counterpart. Given the lack of competing spices, white rum holds a purer taste which will pair well with a wider range of drinks and other spirits. Gin’s unique flavor profile comes from an equally unique distillation of the juniper berry blended with other natural botanicals. Containing notes of bergamot tea, caraway seeds, lavender and cucumber, quality gin makes for complex yet delicious homemade cocktails that only need one or two other mixers. From beach-ready tequila sunrises to cooling blended margaritas to the simple, refreshing Paloma, tequila is an ever-popular and ever-mixable spirit. Derived from the fermented juices of the blue agave cactus, silver tequila tends to be bottled immediately or soon after distillation in stainless steel containers rather than oak. This helps preserve the sharp, tangy wild agave notes, which then become the template for a range of creative mixed drinks. Bourbon is a type of whiskey that hails from Kentucky and follows a rigid set of distilling and aging techniques. For example, bourbon’s mash — the grain base — cannot be lower than 51 percent corn — a deviation from traditional whiskey, which is mashed mainly from barley, rye, wheat or all of the above. Ready to bust out your shaker and mix a few high-quality cocktails that’ll impress your friends — but contain four or fewer ingredients? Pick from this popular yet easy-to-mix drink list for your next “evening in,” with homemade cocktails that’ll taste like they came straight from a craft mixologist. Transport yourself to the Spanish coast with this fruity favorite made from whatever produce is in season. Sangria comes in two forms — red and white — depending on which wine base you use. The former relies heavily on berries while the latter favors fruits like pears, peaches and pineapple, mixed together with your choice of low-tannin wines and a splash of brandy. Low-tannin varietals are sweeter and generally less acidic, making them a better match for fresh fruits. We suggest gamays, cabernet francs, pinot noirs and red or white zinfandels to make your next sangria. Red sangria directions: Squeeze the juice of one large orange into a 2-qt. pitcher. Thinly slice another 1-2 oranges, 2-4 nectarines, one package of raspberries and one package of strawberries, adding prepped pieces to the pitcher. Pour 750 ml (one full bottle) of low-tannin red wine of your choice. Add 1/2 cup brandy. Mix, chill and serve. White sangria directions: Squeeze the juice of two large lemons into a 2-qt. pitcher. Thinly slice another 1-2 lemons, one lime, two peaches, one package of strawberries and half a pineapple, adding prepped pieces to the pitcher. Pour in 750 ml. (one full bottle) of dry white wine of your choice. Add 1/2 cup of brandy. Mix, chill and serve. Bonus tip: Add a splash of seltzer for a fizzier, lighter sangria. Few mixed drinks match the creamy, smoothie-like satisfaction of freshly blended piña coladas. Best of all, they’re one of the easiest mixed drinks to make at home. All you need is pineapple, coconut milk and white rum. Directions: In a blender, combine 1 pound (about three cups) of frozen or fresh pineapple, 1/2 cup of white rum and 2/3 cup of coconut milk. Blend until smooth. Add ice cubes or pineapple to thicken or thin out with water or more coconut milk as needed. Cuba’s claim to mixed-drink fame is a refreshing blend of white rum, mint and sugar. The combination is a flavorful yet approachable beverage you can enjoy throughout the year, balmy Havana night or not. Directions: Combine 1 oz. of simple syrup with a handful of fresh mint leaves. Muddle together using the back of a spoon. Add 1 1/2 oz. of white rum, then muddle some more. Squeeze the juice from half a lime. Top with 1 oz. of club soda. Stir and enjoy. Margaritas are the most popular mixed drink to make with silver tequila. Classic margaritas pair tequila, orange liqueur and simple syrup with fresh lime juice served over ice, though you can easily blend these ingredients into a frozen drink. Other favorite margarita flavors include strawberry and mango, though for a real twist, try adding the pulp from fresh tamarinds. Directions: In a 2-qt. pitcher, combine 1/2 to 1 cup of silver tequila, 1/2 cup of Triple Sec, 1/2 cup of simple syrup and 1/4 cup of lime juice (about 3 limes). While the liquid mixture chills, sprinkle sea salt on a plate. Dip the rims of margarita or cocktail glasses in water, then onto the salted plate until lips are covered. Serve over 2-3 ice cubes if on the rocks, or blend liquid together with 3-4 ice cubes if frozen. John Dalys are essentially spiked Arnold Palmers, the ever-popular warm-weather drink that’s one part iced tea and one part lemonade. Impress your friends with this ridiculously simple cocktail, one you can add your signature stamp to with a few fun twists. Directions: Combine 1.5 oz. of unflavored vodka with 2 oz. of lemonade and 2 oz. of unsweetened ice tea. Squeeze in the juice of half a lemon. Stir together with a spoon, then serve over 2-3 ice cubes. Bonus tip: For a stronger flavor punch, use sweet tea vodka from distillers like Firefly or Seagram’s. Or you can swap vodka altogether for white rum or even bourbon, altering the cocktail toward more vanilla-like sweetness. The perennial whiskey sour lets a good bottle of bourbon shine. Plus, the sweet and sour notes of this great mixed drink are easy to achieve at home, requiring only lemons, simple syrup, and of course, that signature bourbon whiskey. Directions: Combine 2 oz. of bourbon with 1/2 oz. simple syrup and the juice of half a lemon. Transfer mixture into a shaker and shake for 20 seconds. Serve in a classic cocktail glass, no ice. Harness your inner Don Draper by making your own homemade old fashioneds. These whiskey-based mixed drinks can easily handle flavor twists you want to explore — including swapping brandy for whiskey, the popular choice in upper Midwest states like Wisconsin and Minnesota. Just don’t leave out those pungent yet herbaceous bitters, a blend of plant extracts lending old fashioneds their signature bite. Directions: Muddle 1 thick orange slice with 2 Maraschino cherries and 1 teaspoon of Angostura bitters. Add 2 oz. of bourbon, 1/2 teaspoon of sugar and a splash of orange liqueur or seltzer (optional). Mix in a shaker and serve in a standard cocktail glass with one ice cube. Gin and tonic lovers rejoice! Tom Collins cocktails carry similar ingredients and aromatic notes as their classic rail-drink cousin, yet have the bonus of both lemon and lime juice brightening sips. Directions: Mix the juice of 1 lime and half a lemon with 1/2 oz. simple syrup. Combine with 2 oz. of gin and 2 oz. of club soda or tonic. Stir together, then enjoy over 2-3 ice cubes. Is brunch even brunch without a mimosa? What about the fruitier, tarter bellini? These classic champagne-based mixed drinks are deceptively simple, requiring only a handful of sweet ingredients to bring the best of weekend brunch to your home. Mimosa directions: Mix 2 oz. of champagne with 2 oz. of orange juice. Pour into a chilled glass and enjoy. Bellini directions: In a blender, puree 1 1/2 pounds (3-4 cups) of frozen peaches with 1 tablespoon of sugar and the juice from half a lemon. Pour in 750 ml. (one bottle) of chilled Prosecco, stirring slowly to prevent the mix from over-frothing. Pour into chilled glasses and enjoy. The Palomas is an under-the-radar tequila cocktail any level mixologist can have up their sleeve. At their most basic, Palomas mix tequila with grapefruit juice or grapefruit-flavored soda. However, elevated versions of this tart and spiced cocktail are easy to master by adding muddled kiwis, mangos, pomegranates and even candied jalapenos for a true one-of-a-kind mixed drink. Directions: Combine 2 oz. of silver tequila or mezcal with 2 oz. of fresh grapefruit juice and 2 oz. of club soda. Stir in the juice from 1 lime wedge. Add a dash of sugar to taste, if necessary. Pro tip: Simplify making Palomas at home even more by buying grapefruit sparkling water, merging the grapefruit juice and club soda steps into one. Directions: In a shaker, mix 2 oz. of vodka or gin with 1 oz. lime juice (about 1 lime) and 3/4 oz. simple syrup. Shake until fully combined, about 30 seconds. Serve over 2 ice cubes. Known for being served in their iconic copper mugs, Moscow Mules marry the bold, fresh snap of ginger with crisp vodka and tart lime juice. It’s that simple — yet so satisfying. Directions: Squeeze the juice of half a lime into an 8-oz. glass with 2 ice cubes. Add 6 oz. of ginger beer, then 2 oz. of vodka. Stir until combined, about 10 seconds. Mixed drinks don’t discriminate — a really good cocktail can satisfy during meal time, happy hour — and dessert. The art of making cocktails at home can extend even when the sweet tooth comes calling, giving you plenty of sumptuous yet sippable dessert drink options. 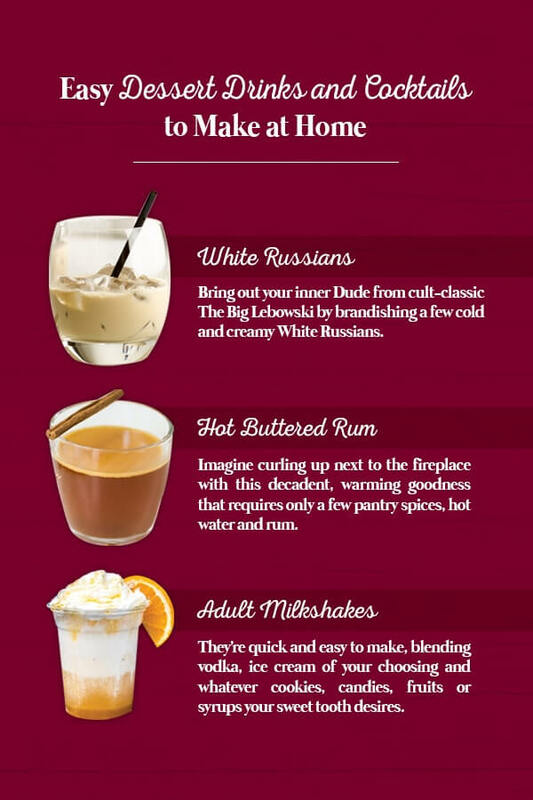 Bring out your inner Dude from cult-classic The Big Lebowski by brandishing a few cold and creamy White Russians. Trust us on this one — the Dude abides. Directions: Pour 1 oz. of whole milk or heavy cream into a glass. Add 1 oz. Kahlua coffee liqueur, then 2 oz. of vodka. Drop in an ice cube, then sprinkle with cocoa or cinnamon. Stir and enjoy. Forget hot chocolate! Imagine curling up next to the fireplace with this decadent, warming goodness that requires only a few pantry spices, hot water and rum. Directions: In a mug, prepare the spice mixture by mixing a tablespoon of soft, room-temperature butter with 1 tablespoon of brown sugar, 2 pinches of cinnamon, 1 pinch of nutmeg, 1 pinch of clove and 1 pinch of coarse sea salt. Heat 2-4 oz. of hot water, using either a tea kettle or the microwave. Pour the hot water over the spice mixture. Add 2 oz. of dark or spiced rum. Stir together until a light layer of foam appears on top. Boozy milkshakes are the grown-up version of the near-universal childhood treat. They’re quick and easy to make, blending vodka, ice cream of your choosing and whatever cookies, candies, fruits or syrups your sweet tooth desires. Directions: In a blender, combine 1 oz. of Baileys Irish Cream, 1 1/2 oz. vanilla vodka and 1 scoop of vanilla bean ice cream. Blend until a smooth, pour into a chilled glass and top with whipped cream. Chocolate: Use chocolate ice cream or add 1-2 tbsp. of cocoa powder to your blender mix. Peanut Butter: Add a generous dollop of creamy peanut butter to your blender mix. Salted Caramel: Use bourbon instead of vodka, then pulse 2 oz. of salted caramel sauce into your blender mix. Cookies ‘n Cream: Finely crush half a cup of Oreo cookies, then toss the crumbles into your blender mix. Marketview Liquor’s extensive inventory of spirits and wines is the perfect inspiration for your craft cocktails. Browse one of the largest wine catalogs available for wine bottles and cases, available for in store pickup in the Rochester NY area or shipped directly to you in most states. Our liquors and spirits are available for online ordering with quick in-store pickup at our Rochester, New York location. This entry was posted in Liquor, Recipes by webpagefx@gmail.com. | Bookmark the permalink.